Welcome aboard the 49 passenger sailing catamaran, the Spirit of America, only at the State Park Marina. Fresh water, salt water; lake or ocean—nothing says summer quite like being out on the water. I’m walking along the edge of the dock, stepping in-time with the melodic refrain of Jimmy Buffet and friends, and I can smell the familiar scent of Coppertone SPF 30. 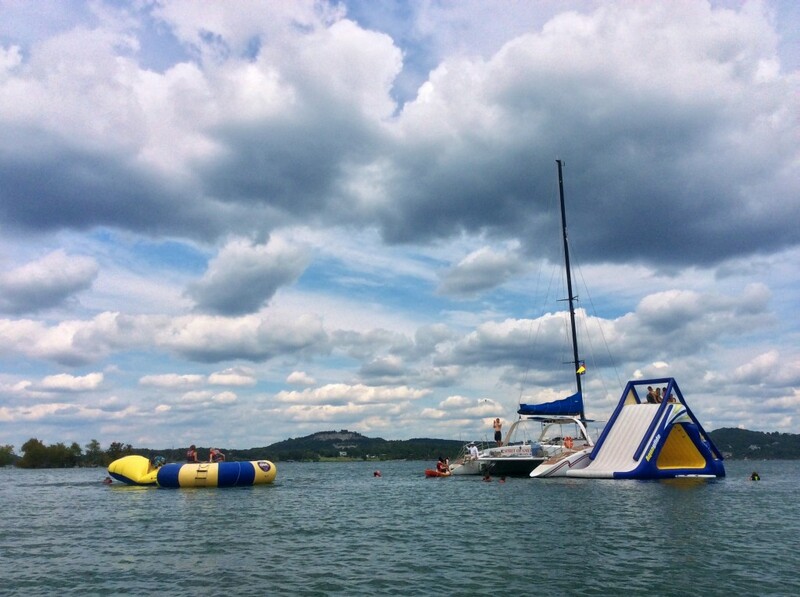 I can feel the brush of a gentle summer breeze on my skin and, through my shades, enjoy the sights of the blue sky and the beautiful Table Rock Lake. I give the First Mate my ticket and notice the welcome sign that reads “Naked Feet Only” (that means no shoes). I’ve found a seat on the deck, and the First Mate unties the boat as Captain Jack steers the boat across the waves, out of the marina, toward the anchor point. Welcome aboard the 49 passenger sailing catamaran, the Spirit of America, only at the State Park Marina. Spirit of America sets sail every day at noon and 2:00pm, operating a sailing cruise and a Water World Adventure Cruise, but also a Sunset Celebration Cruise, at dusk. My ticket is for the 2:00pm, two hour Water World Adventure Cruise… which became pretty obvious when I saw all of the toys we were tugging along with us behind the boat! Accompanying us are many different water toys/activities: kayaks, a water trampoline, a blob, and a 20+ ft. inflatable water slide. This has “good time” written all over it. Fast-forward twenty minutes, and a beautiful cruise across the lake, and we’re dropping the anchor so we can get in the water. Now the fun begins. For the next hour we can choose to play, get a nice tan or simply relax. I took to the kayak first for a while before hopping back on the boat for a while to relax. But the giant slide looked too tempting for me not to jump in. I dove in, swam to the starboard side, and began climbing up the mountain of a slide. The view from the top was great… but the plunge down to the water was even better. With five minutes of swimming remaining, Captain Jack sounded the bell (kind of like mom used to do when calling us in for dinner) to notify the passengers and crew it was time to pack up and head back to port. It didn’t, however, mean that the fun was over. On the return trip to the dock, passengers finished the expedition hoola-hooping, competing in the limbo, and dancing the YMCA and Macarena among other classics. From the time my bare feet stepped onto the deck, to the time I put my sandals back on at the dock, the Spirit of America had me sailing on high spirits. One thing is for sure: nothing beats the feeling of warm weather, sunshine, laughter and good times. Those can be found aboard the Spirit of America. As I mentioned before, Spirit of America also has a relaxing sail cruise. 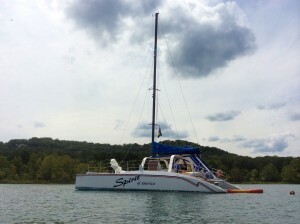 On the sailing cruise, crewmates and passengers lift the prop and hoist the sails, then kick back and relax for a 90-minute excursion on the pristine Table Rock Lake. The Spirit of America accommodates businesses, groups and other private charters (up to 49 passengers) for virtually any occasion! Contact Captain Jack Edwards for reservations at 417.334.2628, or visit them online at www.StateParkMarina.com.